10pcs 4mm-30mm Diamond Hole Saw Drill Bit for Glass Ceramic Marble Tile by BephaMart at MDA-MA. MPN: 101. Hurry! Limited time offer. Offer valid only while supplies last. 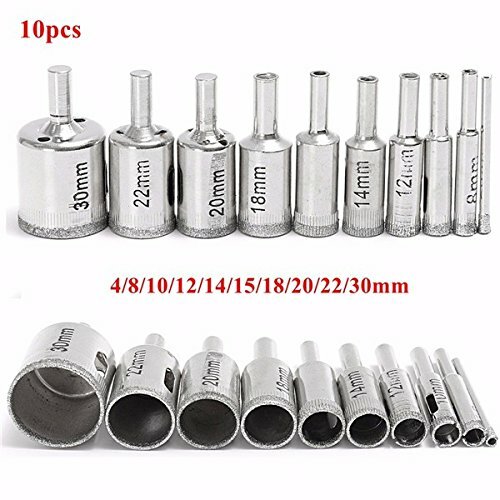 Description: 10pcs 4mm-30mm Diamond Hole Saw Drill Bit for Glass Ceramic Marble Tile Specification: Material: Diamonds Color: Silver Length: Approx. successfully complete the hole operation. -Note that when the hole in the speed can not be too fast, must be slow, in the process of opening the hole must be added water cooling device.